3CX is a software based PBX which runs on mainstream operating systems, and works with SIP standard based IP Phones, SIP trunks and VoIP Gateways to provide a full PBX solution – without the inflated cost and management headaches of an ‘old style’ PBX. Used by more than 30,000 companies globally, 3CX has been recognized for its innovation and cutting-edge technology. Easy Installation and Management or have us Manage the 3CX Insallation and Configuration for your organisation, Call us on 1300 725 421 to speak with a Telephony Engineer about your requirements. Because 3CX is software-based, it is easily installed and managed by IT administrators without the need for special telecom skills. 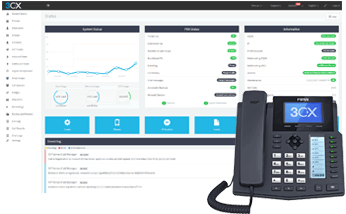 It’s preconfigured to work with popular IP Phones, VoIP Gateways and SIP trunks saving you the hassle of having to configure and manage these devices. With 3CX, companies can reduce their telephone costs by up to 80%, by leveraging SIP trunks, WebRTC, free calling to remote extensions and offices and reducing the number of fixed telephony lines. With the CRM integration, agents get a customer name rather than a number. HostingWorx have supported us for several years with Computer Repairs and Web Hosting and always provides us with the solutions for our business needs. With expertise in a range of CMS platforms such as Wordpress, Drupal and other leading names. We built our first store back in 2003 with osCommerce. Today we assist clients in many of the leading cart products such Loaded Commerce 7 with built-in Mobile and custom addon develepment. We have expertise to be able to provide support for all your office computers, servers network and inter office needs - Give us a call today. Themes can give you a head start at times but many times php, html & css need to be modified we can do fast cost effective changes as you need.